Gönül Düzer, 28, had been trying to organize her own workplace, the campaign affiliate, including a march on the boss after the termination of another worker. 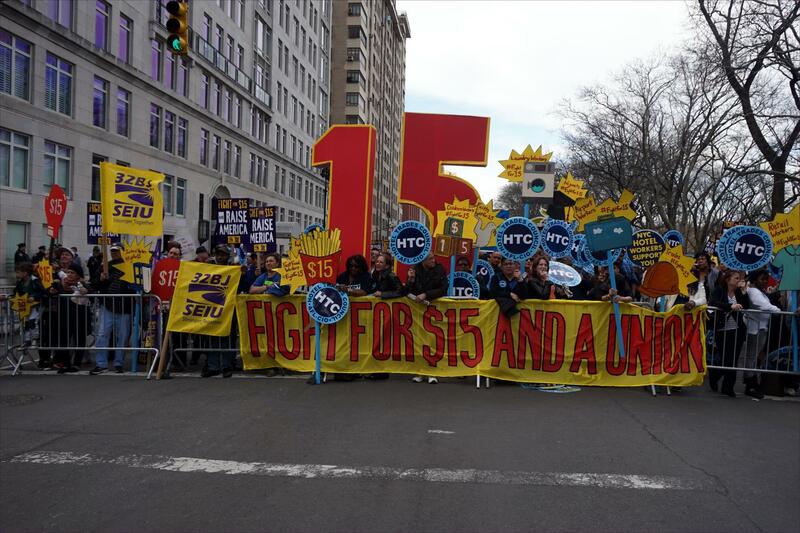 WOCC is the Chicago-based affiliate of Fight for $15—a nationwide effort of fast-food workers organizing for higher wages, funded by the Service Employees International Union (SEIU). While the campaign has achieved substantial gains in influencing cities and states to increase the minimum wage, some Fight for $15 staffers, like Düzer, say these wins have come at a cost. “I’m happy that the legal process of the Unfair Labor Practice has come to a close. I hope that by winning the settlement, I’ll be able to embolden others,” she added. Düzer was fired from the Chicago-based affiliate of the Fight for $15 campaign—the WOCC —in June 2016. The February 2017 ruling from the National Labor Relations Board (NLRB), which awarded Düzer reinstatement plus full back pay, found that she was fired for protected concerted activity. This is a legal way of saying organizing. There was no admission of guilt in the settlement. WOCC organizers started having issues with supervisor and Fight for $15 Chicago city director Caleb Jennings in April 2016. Düzer says a coworker was fired without cause and, in response, she and other organizers went to Jennings’s office to deliver a letter demanding their coworker’s reinstatement. According to Düzer, Jennings refused to reinstate the worker, saying the employee in question had been in his “probationary period” and, thus, could be fired for no reason. Jennings then proceeded to threaten other employees with termination, Düzer alleges in her NLRB complaint. More than 50 employees of three Chicago-area SEIU locals wrote a letter in support of Düzer in the wake of her firing. The June letter was addressed to SEIU Local 1 president Tom Balanoff, the president of SEIU Healthcare Illinois & Indiana, Keith Kelleher, and former SEIU Local 73 president Christine Boardman. “This incident won’t surprise those familiar with the working conditions at the FF15. [Jennings] has made himself well known for creating a toxic work environment. This has led to a high turnover among staff. Gönül will be the third woman to resign or be fired within the last 2 weeks,” it read. Düzer’s firing came soon after nearly 100 Fight for $15 organizers announced their membership in the Union of Union Representatives (UUR) in May. When a group of these organizers attempted to deliver a letter declaring their UUR membership to a SEIU President Mary Kay Henry at a national conference in Richmond, Virginia, “security guards stopped them from delivering the letter and escorted them away from the stage,” wrote David Moberg in August. “We are disappointed that SEIU chose to escalate and create divisions between workers and organizers rather than act on our shared principles and beliefs about the fair treatment workers deserve,” UUR president Conor Hanlon was quoted as saying. UUR does not represent workers at WOCC. Office and Professional Employees International Union (OPEIU) Local 9 does. But in response to the issues at WOCC in Chicago, Hanlon said: "It’s clear that the Workers Organizing Committees [of Chicago] are controlled by SEIU and running an SEIU organizing campaign. Unfortunately, rather than hire organizers directly, SEIU has chosen to create shell organizations and outsource the work. "As union staff we are no strangers to these types of tactics—we see the use of outsourcing, temp agencies, independent contractors, and double-breasted operations from private sector employers as a way to escape commitment to their workers and avoid unions every day. "We know that workers pay the price for employer flexibility with lower pay, less job security, and great risks to health and safety. The organizers and staff on the Fight for $15 campaign are fighting for the same things that SEIU members and non-union workers fight for, and it's disheartening that SEIU continues to stand in their way." SEIU International’s Media Department did not respond to requests for comment when attempting to reach them in April. While SEIU has been in the headlines, accused of exploiting its own staffers, the problem runs deeper than just one union. While it is easy to point fingers at one individual or one union, the problem is with the labor, generally, which has forgotten that it’s supposed to be a movement, organized by and on behalf of workers. “As union membership declines, national unions are moving away from direct on the job organizing to public advocacy to increase wages for low-wage workers. This unconventional approach creates a conundrum for unions: win higher wages for workers while failing to organize new members,” said Immanuel Ness, political science professor at the City University of New York. As organizers advocate for themselves as workers, holding unions accountable to treating their own staffers fairly may be a growing trend in the coming years. While SEIU has been in the headlines, accused of exploiting its own staffers, the problem runs deeper than just one union.